“It’s one of these things where I feel New York can test you,” he concludes, alluding to the sense that New York has a mind of its own. 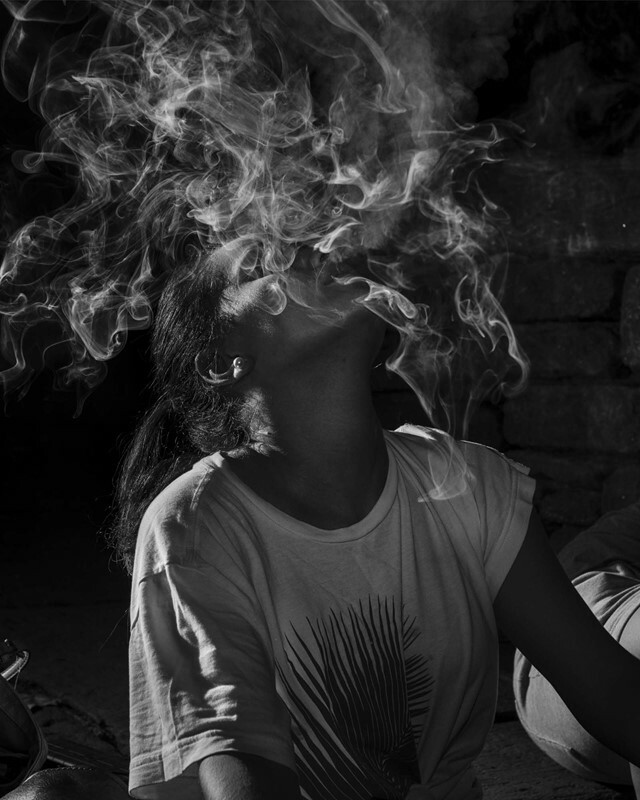 It’s this feeling which is at the core of Dyckman Haze, Pape’s latest book which looks into the sort of magic that takes place in the parks of uptown New York, where urban dwellers go to escape the grid and walk along lines unseen. The photographer was hungry for pictures of New York “that nobody had ever seen before”, adding that he found a “spirit guide” through a landscape that has been so heavily mediated by culture – through films in particular. “I was trying to generate this view of New York at night that wasn’t so dire, but instead was one that was filled with a fantastical atmosphere and humour,” he says. “I was trying to present this landscape as something that is not just another box – whether that’s a cubicle, an apartment, or a train car – but instead something that’s a little bit stranger,” he explains. 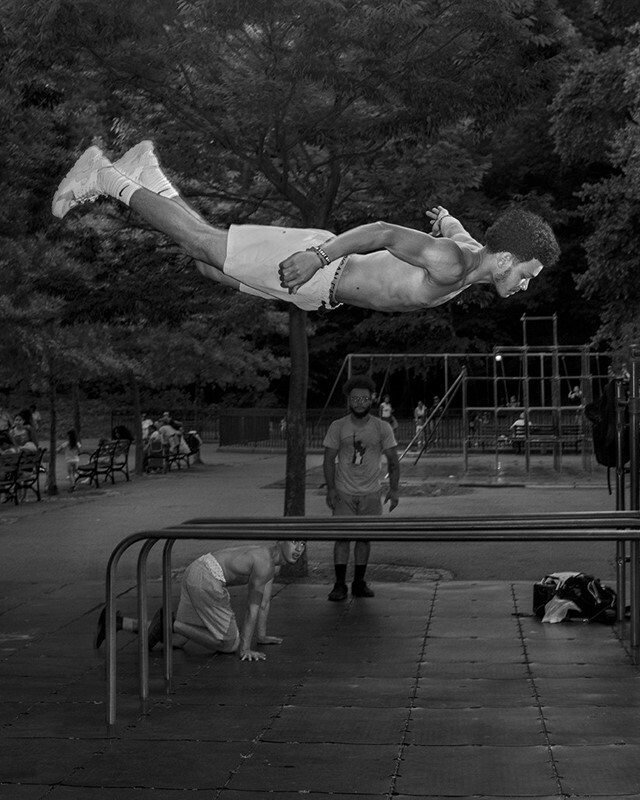 Through Pape’s lens, New York’s parks take on a mythological quality. One image depicts a man’s body hanging upside down, his head facing the ground as if he was looking at his own shadow. Another is seen resting his forehead on the nose of a majestic white husky. Skunks drink from puddles and eat trash under the moonlight. To a certain extent, Dyckman Haze also shows the ways in which the park and its inhabitants – both human and animal – adjust to one another. People find creative ways of using the space to fit what they want it to be. 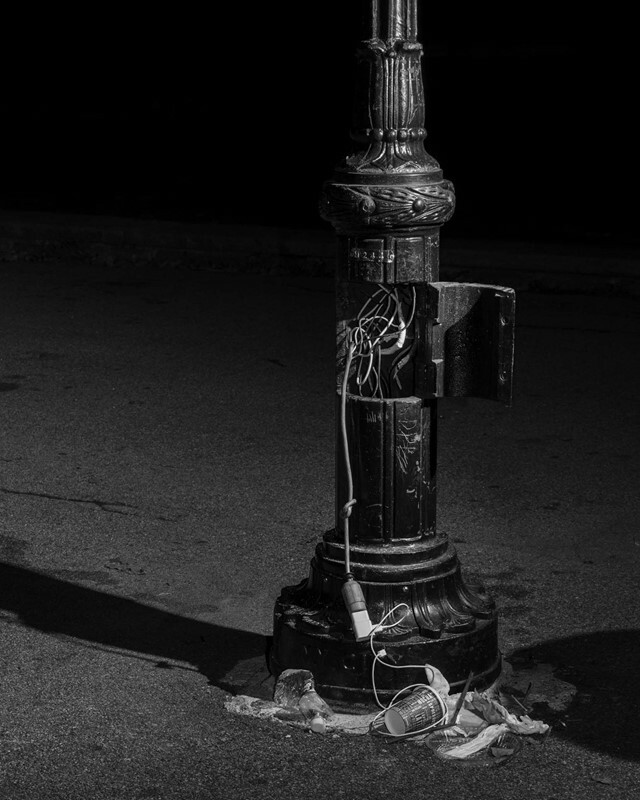 “There is a photograph in the book that is of a 1930s lamp post, but it’s been opened up and rewired and there is an extension cable hanging out of it, and then there is an iPhone charger attached to that,” the photographer says. The book opens on a view of the river banks and Manhattan’s skyline, a train “forever going and coming and taking you to work and out of it”, Pape muses. Towards the end, a scene evokes a similar melancholy. But everywhere in between, the images conjure up an otherworldly space in which to find refuge.